Everyone knows that HyperX is a Kingston brand, and that Kingston is well known to deliver quality items to make your digital world easier, and better. 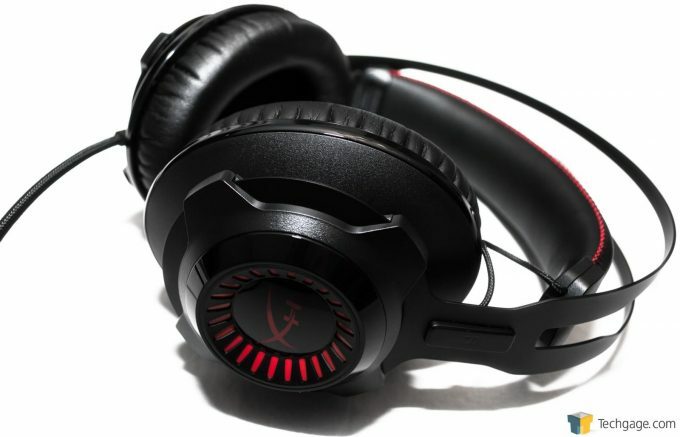 Today we are looking at the HyperX Cloud Revolver gaming headset, which promises a studio-grade sound stage. How did this headset fare? Let’s take a closer look and see. Kingston has been around for as long as I can remember, and when I think of Kingston, I immediately think of RAM, and USB thumb drives. Kingston is actually the largest independent manufacturer of memory products in the industry. It has expanded its reach into much more than that over the years, however. Today we are looking at its HyperX division, which is gaming-centric, and has had a lot of exciting offerings over the years. Everything from RAM, SSDs, USB drives, mouse pads, and gaming headsets, which is what we are looking at today. Building off its already very successful line of gaming headsets, the Cloud line, today’s offering is the HyperX Cloud Revolver headset. The headset connects to your device a couple of different ways. 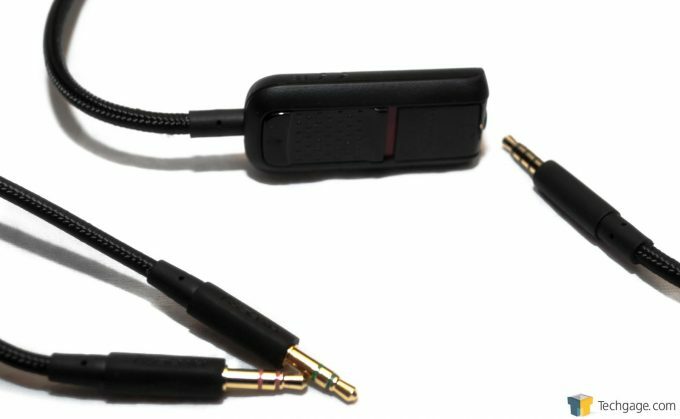 Firstly, is through a 4-pole 3.5mm stereo connector that will work with your smartphone and connect the microphone as well through a single connection. Secondly, you can also connect through separate 3.5mm connections, one for the stereo headphones, and one for the microphone, utilizing an audio control box; we’ll dive into its use a little later on. The main 4-pole cable is 1 meter long, and with the audio control box with separate mic/headphone connections added, makes the total cable length 3 meters. The drivers for this headset are dynamic 50mm with neodymium magnets, which HyperX claims are ideal for gaming in FPS or open environment game play, as you will be able to more accurately identify other player’s position, even when they are further away. It also claims that you get a more “concert hall” like experience when listening to music. This headset is a closed-back style, which some audio enthusiasts will turn their nose up at, because open-back headsets, arguably, do have a fuller, more realistic sound profile than closed-back. The differences can be extremely subtle, but this is just the nature of the acoustics of headphones. 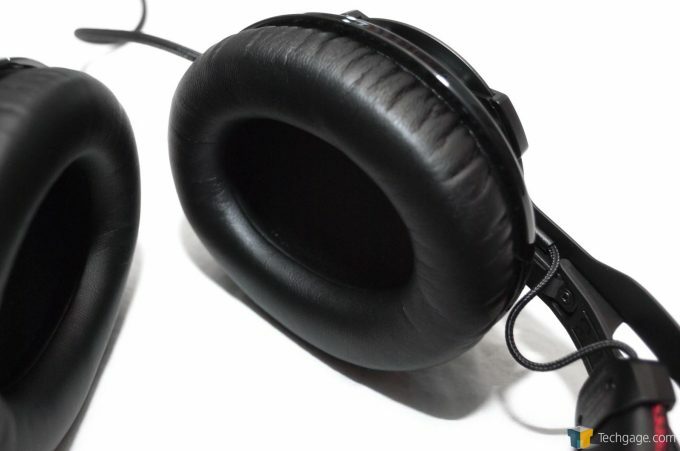 However, open-back headphones are generally not an option for most people, as most people don’t want to be (or can’t be) subjecting their surroundings to whatever it is they are listening to, so the closed back is by far the more popular option for most headphones out there. There are small vents in the back for better bass response. The frequency response of this headset is rated at 12hz – 28,000 hz. Most humans can only hear between 20-20,000 anyway, so take from this spec what you will. The impedance of this headset is 30 ohms with an input power rating of 30 mW with a maximum of 50 mW, so no need for an audio amp for this; plugging into your normal gear will do just fine. The weight of this headset is 360g, or just over 12.5 ounces, and the microphone adds a mere 16g. The microphone is of the electret condenser variety which is uni-directional with passive noise cancelling. This headset sports two main colors, a matte finish black and solid red. The main body of the headset is black, featuring the red HyperX logo in the center outside of each ear cup with red hashes around the logo, perhaps styled like a turbine engine or something. The headband is also black with red stitching, which gives it a really nice look. The main headband is steel, connecting the two sides together, with a suspension style comfort band just below the headband. The wires connecting the two sides has a braided type of covering like you also find on the cable, and on most gaming keyboards and mice now a days. The ear cups are generously large, which unless you are Andre the Giant, should allow your entire ear to comfortably fit inside. The cups themselves are a special HyperX memory foam, and those are covered in a leatherette. The cord comes out of the bottom of the left hand side (thank you for making that standard, HyperX) and is just behind where you connect the boom-style microphone. The boom-style microphone matches the aesthetic of the headset nicely, and is flexible so that it can retain the position you put it in. 1 meter down on the main 4-pole connection you find the audio control box. Here, you can plug in the 2-meter long pigtail, if you wish to connect to your device with separate audio and mic connections. There is a volume knob and a mute switch, if you wish to control this independently of your device. The audio control box also features a belt clip. From the moment I opened the box, I was instantly met with the strong impression of high quality. I generally try not to let first impressions play too heavy a role in my reviews, but this product screams quality right when you take it out of the box. Firstly, the headphones fit very, very well. I have a rather big head, and this can be a point of contention with me and headphones, as some simply don’t fit my head well, or are uncomfortable to wear for extended periods. The articulation of the hinge on both ear cups gives the HyperX Cloud Revolver a great edge in fitting your head very well. This headset fit me very well, right out of the box, and continued to fit well after several weeks of continuous use. They were extremely comfortable to wear for long periods of time, and I credit this largely to the suspension style headband. This suspension system though, is probably my biggest praise and also my biggest complaint about the HyperX Cloud Revolver. I noticed that when wearing these, if I turn my head, or look down, that the suspension band gives a little, as it should. My issue is, when it does this, it gives off a sound. The sound isn’t that loud, but it is certainly noticeable, like a rubbing sound when the band moves. You can duplicate this yourself with the headphones off your head, just slowly move the headband and you will feel it. I almost feel like there needs to be something added to the headband to lower the coefficient of friction, like Teflon strips on either side of the internals of the headband. Now this is not a major deal, as I feel the benefits of the suspension style headband outweigh this rubbing sound, but I feel like with a minor Engineering revision this issue could be easily remedied. Sound quality is such a subjective thing, and is really hard to articulate unless you are sitting right next to me and can listen for yourself. Overall, I found that the highs and lows are very abundant. The bass is extremely good, very tight and accurate, but not overwhelming. I listen to a lot of dub step at work, and it sounds absolutely fabulous in this headset. I did notice a bit of the mid section of the audio spectrum to be a little low, vocals are not quite a smooth as they could be. Keep in mind, I am being very picky here, as this headset sounds very, very good on the whole. The treble is high, bright, clean, and not sibilant whatsoever. There is no tinny character, and sounds very pleasant even after hours of use. I noticed when listening to Rock, it did have a bit of a hollow character in the sound. As I mentioned earlier, the mids are a little low, and this gives a sensation that the singer is distant, or far away. Again, being very picky here. The microphone works very well, I received no complaints whatsoever. You are not going to be recording voice over work for Emmy award winning documentaries, but for gaming, teleconferencing into meetings, it works just fine, even in noisy environments thanks to the noise cancelling mic. In closing, even with the (VERY) minor concerns with the audio, and the noisy suspension style headband, this HyperX Cloud Revolver headset is an amazing value. 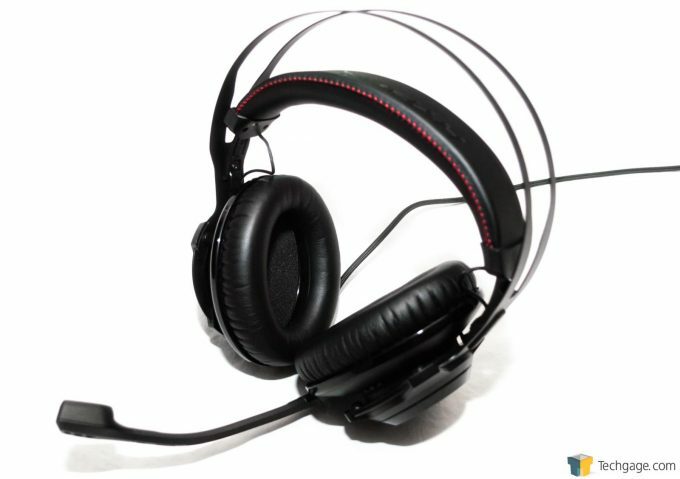 The features on this headset like the memory foam leatherette covered ear cups, and the suspension head band, would generally put you into the $300+ price range, not to mention the fantastic audio that this headset offers. I am seriously impressed with the Cloud Revolver set, especially when you consider the price point of only $104.99 on Amazon, and just slightly higher at other retailers. Extremely comfortable to wear, thanks to suspension headband and highly articulate hinges on the ear cups. Plush, thick leatherette covered earcups. Suspension system is a little noisy. Some may find the mids in the audio slightly lacking.